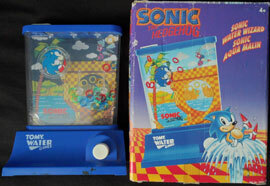 Still more wonderful and interesting miscellaneous Sonic items from Britain (and around in the UK) all of these things were either made there or sold there. This page should also be a mixture of old and new items. Info on where to get the item is added where possible. As more categories are added, things may move off these "General Merchandise" pages and onto more specific ones. come with a plastic pin badge. (seen in upper right corner) So it's like a card with a mini gift! Inside, some have repeats of the art, or mazes. 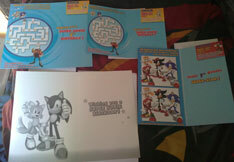 (the maze has a Sonic vs Eggman theme, while collecting rings) There are also character profiles (top right corner) You can see the maze solutions on the card-backs. The one with two pictures is a "spot the differences". 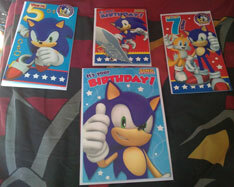 The messages are "Have a Super Sonic Birthday, or a variant of "Super # birthday SuperStar" These cards began appearing in 2011/fall. You should be able to find them in ASDA stores. Photos & owned by Shadouge. 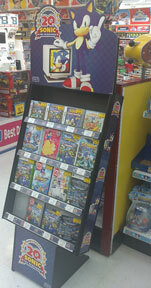 In Toys R Us stores of the UK area, you'll probably find these cool displays in 2011. They're both here to celebrate the 20th Anniversary. The tall one is an aisle end-cap type free-standing one, to showcase only Sonic games, regardless of if they're on sale or not. 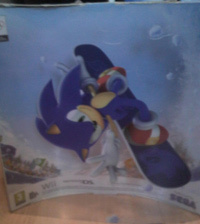 The second is a special cardboard shelf topper, located above a section of toys and games. 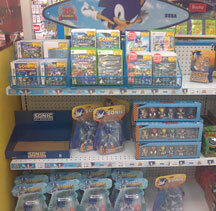 You can see a nice range of Jazwares figures from Colors, the 20th Anniversary small figures, and 3.75 line. That empty box would have had their small plush dolls in it. It's great to see stores having a cool effort around this occaision! 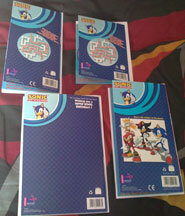 This is a Segaworld London catalog by HMV. 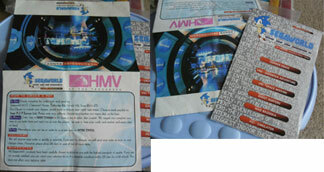 At right, you can see the front, back and how to order along with ordering rules & etc. The left shows the actual order form, and the merchandise you could get. 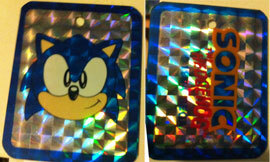 Pretty much all of the merchandise has the same image on it: Running stock Sonic and the "Segaworld" logo/word. The colors of the things vary, but they're all pretty generic/similar looking simple branded things. What all can you see here? Bottom: Various colored caps & hats, left square item is "Record Bag" (yes, for the large vinyl items) center is a plush, right is a "Mini ruck sack" There is also a CD case, & ski cap but the CDs are mock-ups. Middle: Shirts of various colors with the logo in various places, plus a pair of jogging pants. 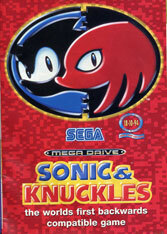 The bottom shirt has Sonic punching through the letters for "SEGAWORLD". Long sleeve, short sleeve, sweat shirt & etc. 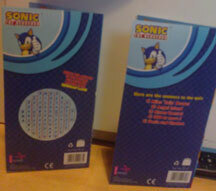 The center shirt has the only large design- 'hands on hips' foreward Sonic stock art. Top: A wool "melton jacket" which is the most expensive at 65 pounds. 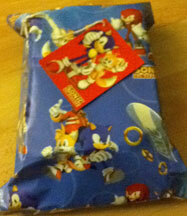 A Rugby shirt, a sweatshirt, a 'big face' shirt which is Sonic with thumbs up in a square (center) and a polo shirt. 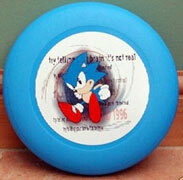 All of the items were fairly expensive ranging from about 8 pounds to over 25. Possibly due to relativly high price for the time, and plain-ness/similarity of the designs the items here aren't common today. 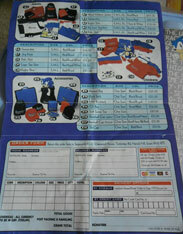 This catalog was active in 1996. Catalog photo & owned by Bianca Nishitani. Here are 2 more birthday cards. One is "Superstar 6" the other is "You're 8". 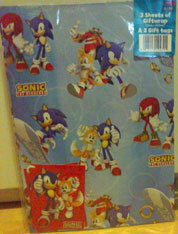 Each has a number with stars on it, and a free bonus pin/button (plastic, in top right corner) The inside of the card has the birthday greeting and either a find the word or a Sonic themed quiz. The backs have the answers, ex. 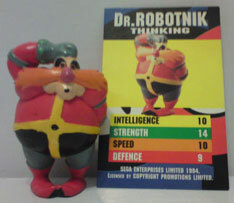 the 'master answer' to the word-find you had to spell was "What does Eggman want to turn the world into? A. Eggmanland". The CG art for the fronts keeps them looking fresh/interesting...but look at how concerned Tails looks. 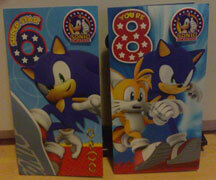 These can be bought at Toys R Us stores in England, & are about 2 pounds each. They began to appear in Fall 2011. This is a rather unusual & rare item! 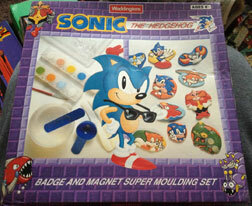 It's the Sonic Badge & Magnet Moulding Set. 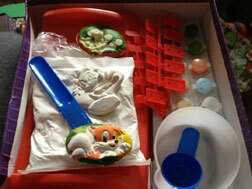 It's a kit where you can make plaster shapes & then paint them with the enclosed colors. If you glue a magnet to the back, it can go on the fridge. Glue on a pin-backing & pin it anywhere (a badge). 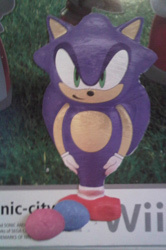 The stock Sonic has had a random pair of sunglasses just sort of pasted on there for some reason.